Economical heated pillow that is rechargeable and cordless - heat on the go! We'd all like to save money on our energy bills and personal heating is a great way to do just that! The Soehnle Heat Pillow is a cordless heating pad that will really take away the chill. With 4 adjustable heat settings and heat period of 4 hours, the Soehnle Heat Pillow is so versatile - use it to cosy up on the sofa and keep warm; warm cold feet in bed or pre-heat your sheets; ease aching joints and even soothe menstruation pain. The Soehnle Heat Pillow works using a rechargeable lithium-ion battery which needs just 3 hours charge - far more economical than firing up your whole central heating system and with no power cable to restrict you, you can take it anywhere. 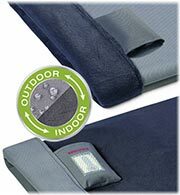 Use this cordless heat pillow inside or out - no more sitting on a cold bench at sporting events! What makes this cordless heat pillow really unique is that it's also reversible - turn the high quality, super-soft fleece pillow inside-out and your Soehnle Heat Pillow becomes water-resistant and durable for outside use too. So you don't have to wear ten layers to watch your favourite sporting event or sit on a newspaper for some insulation - now you can sit in comfort and let the warmth radiate through your body from this portable heated pillow. The Soehnle Cordless Rechargeable Heat Pillow is simple to use and simple to clean, it's machine washable at 40 degrees and great for heat on the go! All temperatures are approximate and can vary by +/- 5°C.